As the new year dawns, new plans are drawn up for the continued modernization of China's industry. Construction begins on manufacturing and heavy industrial plants in the cities of Taiyuan and Changde in China's interior. 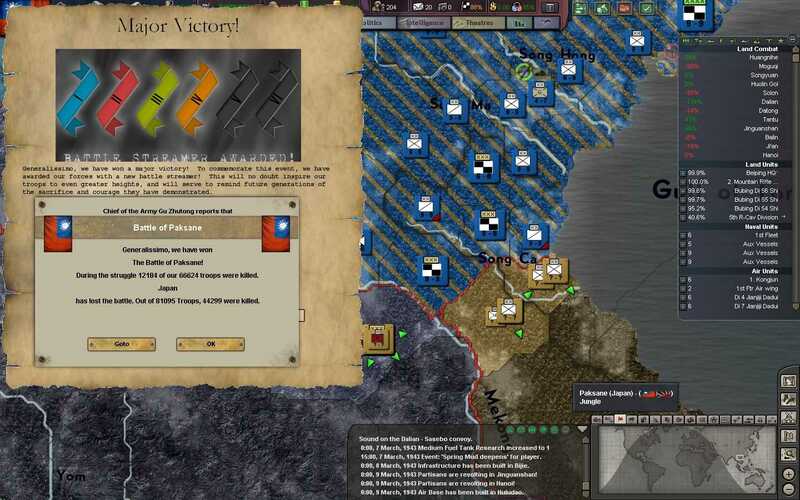 Previously, our troops had made a breakthrough in the North and into Manchuria, but at a great cost. 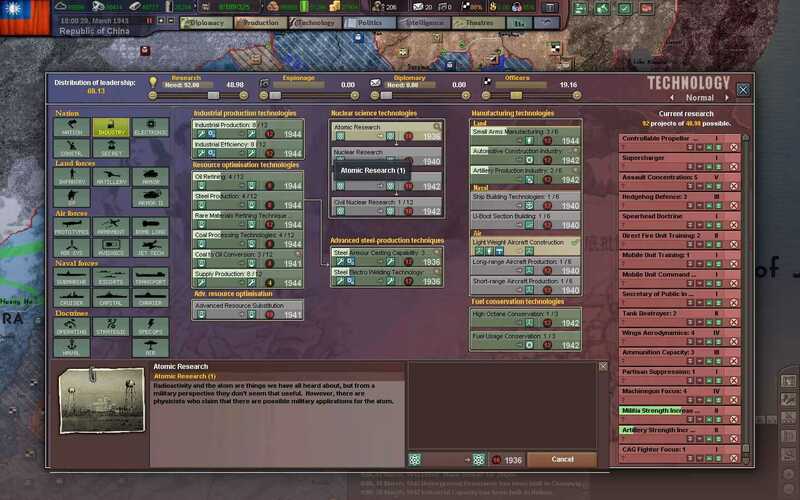 Operations Mule, Lotus, and Blossom had cost the lives of over 500,000 National Revolutionary Army (NRA) men, but now their sacrifice has opened up the path to liberation for the rest of China. 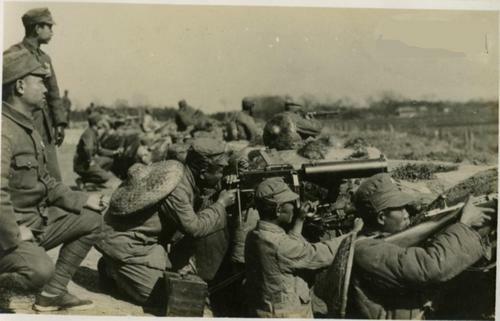 The Imperial Japanese Army (IJA) is in full retreat, and the infamous city of Mukden is being assaulted by our troops. 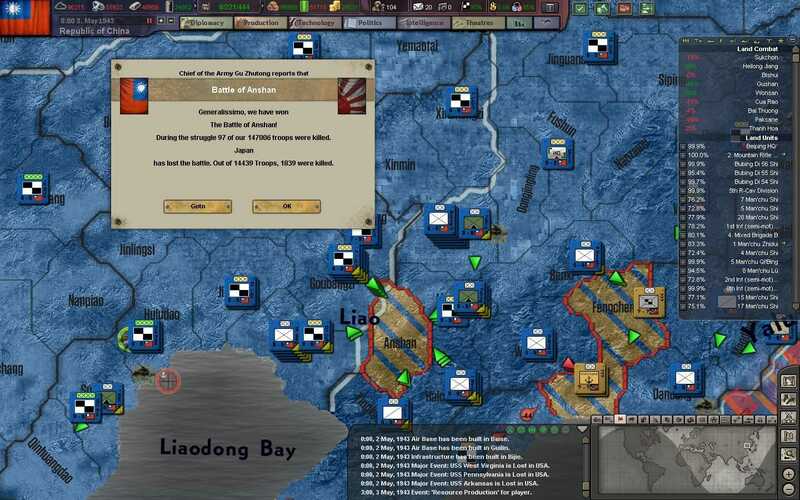 On the Liaodong Peninsula, our troops and elite mountain divisions storm towards the port city of Dalian, which China had lost to the Japanese decades before in the First Sino-Japanese War. 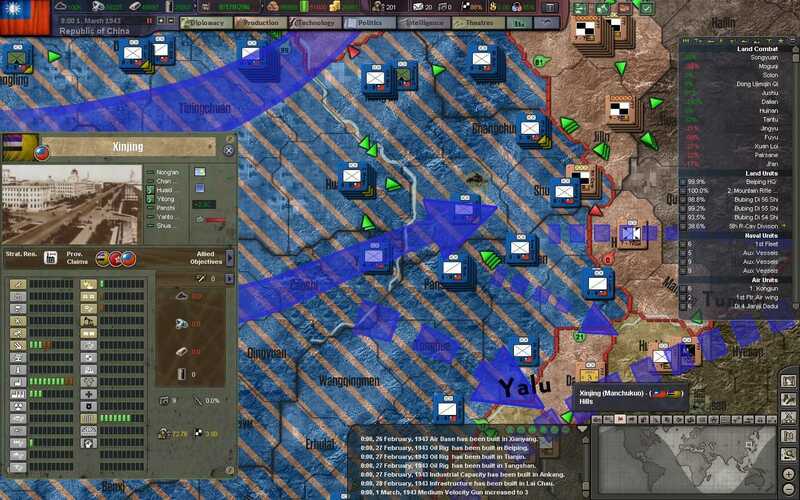 The last healthy remnants of the IJA and the Kwantung Army are now jammed in between our northern advance and Mongolia. The NRA general staff expects that they were gathered in the North to launch a decisive attack to cut off our advance along the coast. 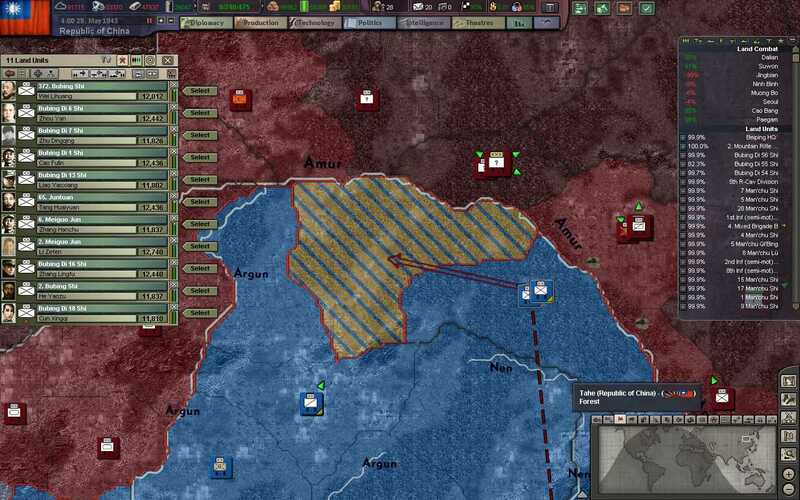 But now that the Japanese lines at Mukden and Dalian has collapsed, their imminent offensive has become meaningless. 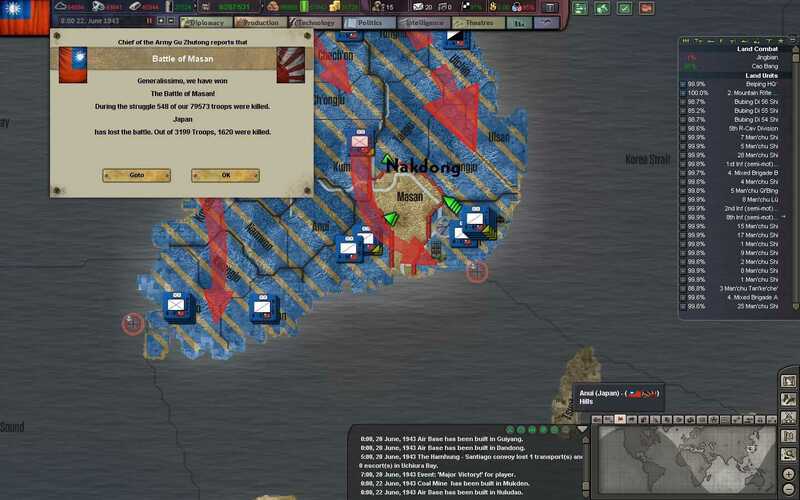 Our light troops and mountain divisions reach the outskirts of Dalian, where the IJA has stationed nearly 20 air wings, a small fleet, and the entire officer corps on the continental mainland. 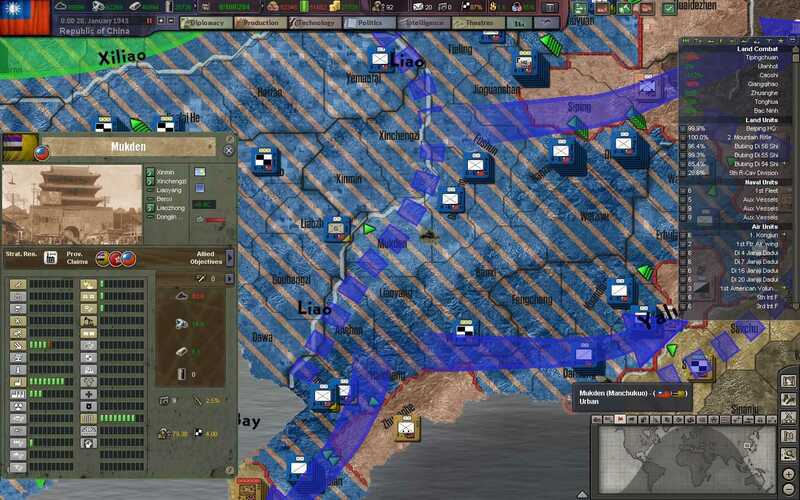 Also present in the city are the recovering remnants of our offensives - nearly 40 divisions who were awaiting reorganization and reinforcement before the NRA came knocking at their door. With our artillery already hitting the city's port and airfield, evacuation is not a viable option for the Japanese trapped at Dalian. The NRA begins digging in and preparing for an assault on the city. 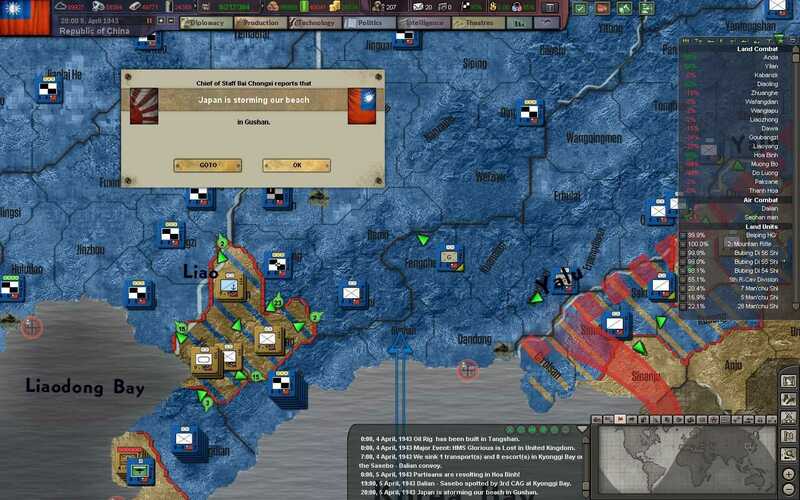 Surprisingly, the tattered remnants of the Kwantung Army and some IJA officer corps units attempt to break out of the city by land, but their exhausted men barely make any progress. 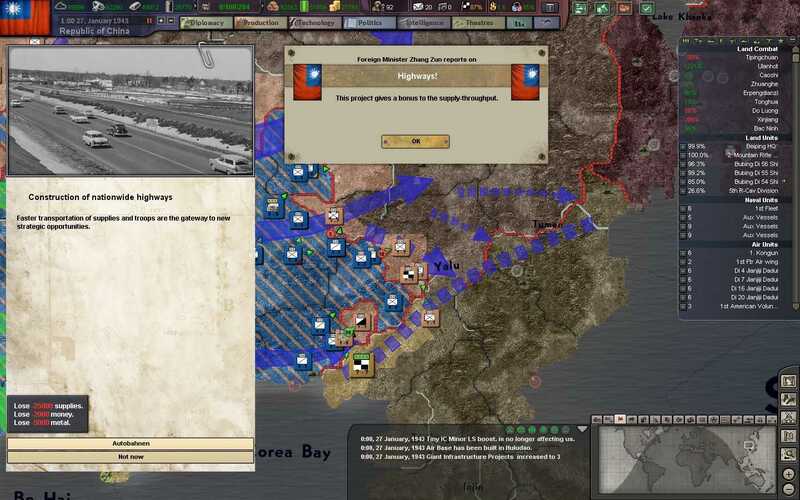 The city of Mukden is taken swiftly, as the city's defenders retreated into Korea and back into the sea. Mukden has, since its capture in the Mukden Incident in 1931, been used as an important industrial hub for the Japanese. Its facilities will suit the growing Republic nicely. 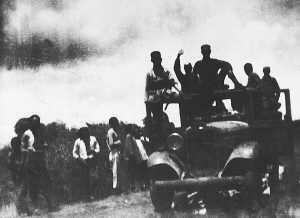 Throngs of civilians come out to greet our victorious troops, and take part in throwing cartridge cases at Japanese POWs marched down the streets as well. Such is life for a IJA infantryman, so often sacrificed by his government. 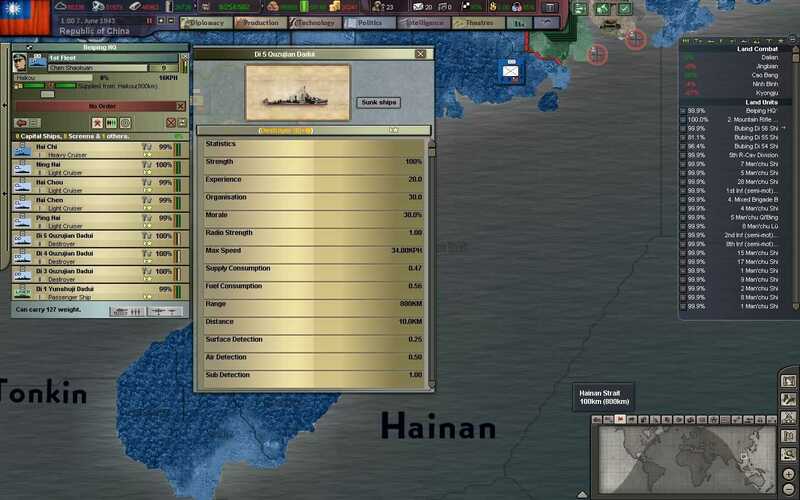 The Republic's Navy, ROCN, begins the construction of the first ships in China's new fleet - two heavy cruisers and three light cruisers. These ships will be heavily outdated to modern standards, but their construction will pave the way for the modernization of our ship-building industry. 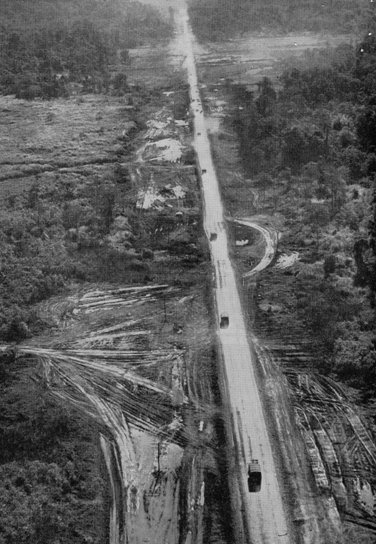 The Interior Ministry also starts the construction of trunk highways between our major cities and industrial centers, which are a major upgrade to the many dirt roads that are used today. Although most of our citizens do not own cars, and travel mostly by train, these new roads will give mobility to the growing number of trucks in NRA service. Certain factories in Shanghai and Ningbo have been converted into automotive plants, which have begun to mass-produce trucks and light vehicles. Our motorized and armored forces, which will soon be growing in number, will certainly benefit from dedicated automotive facilities. 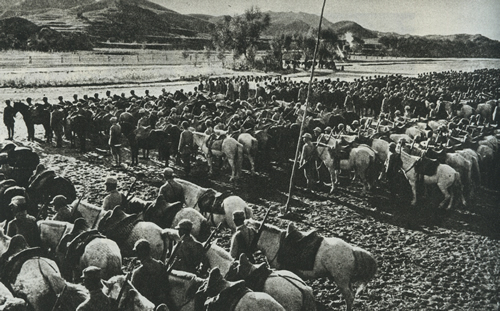 The city of Xinjing is taken by our vanguard forces in Manchuria. 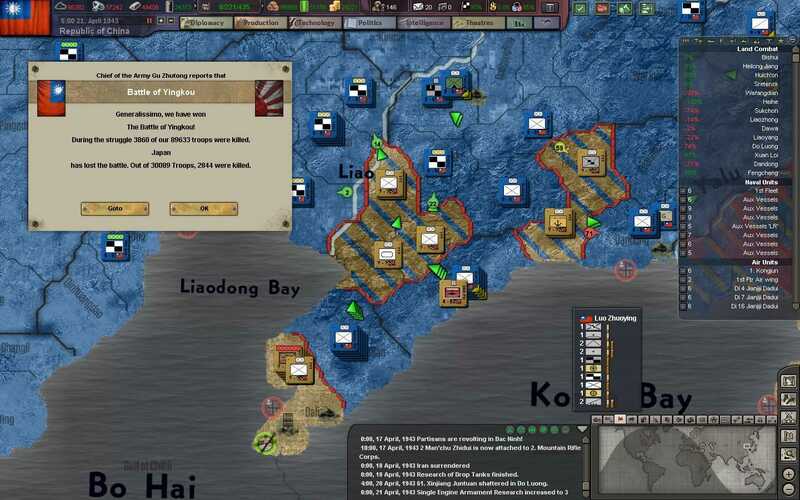 The city is found to be defended by the last remnants of the officer corps of the Kwantung Army, as well as a few garrison regiments who have avoided the heavy fighting over the past few months. Any frontline-quality troops in the IJA have been long whittled down and rendered combat ineffective. Xinjing, like Mukden, brings with it vast industrial and technical resources, which the Japanese had invested into the city over the last decade. 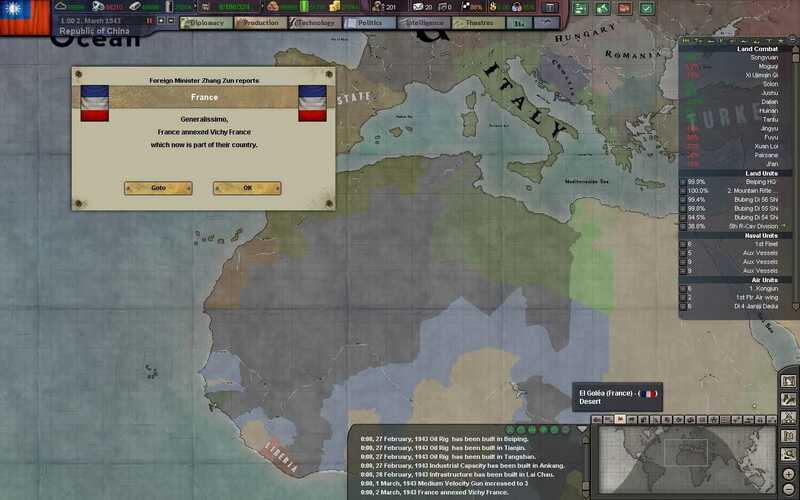 The Vichy regime, which had been ousted to West Africa after the full German occupation of mainland France, has surrendered to combined US, UK, and Free French forces after the success of Operation Torch. 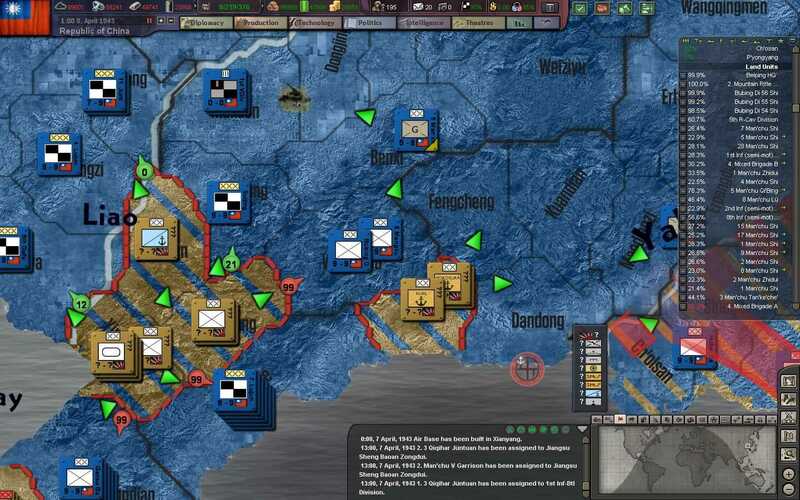 US armored divisions now move on towards Italian Libya. 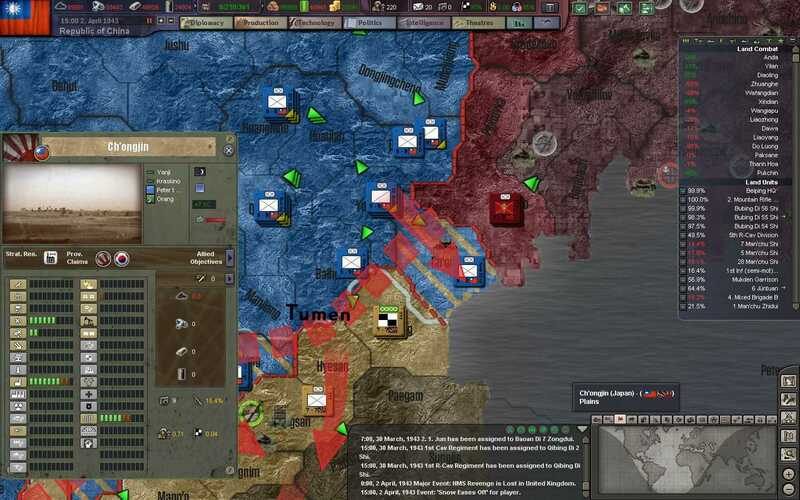 Our newly formed CAGs have claimed their first convoy in the Yellow Sea, although at a great cost. Our torpedo and dive bombers are still extremely vulnerable to Japanese interceptors, and require additional support from our mainland based interceptor wings. 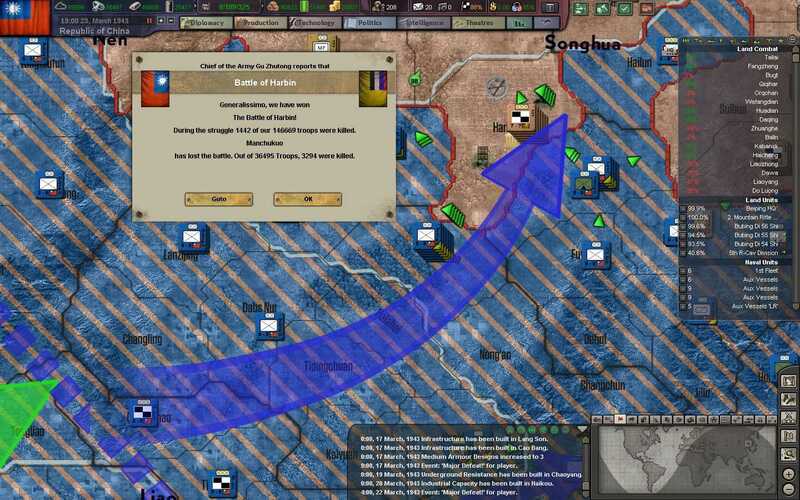 More Japanese divisions are trapped on the border of Mongolia. Japanese troops routinely cross across this border, just so they can be apprehended and interned by Soviet and Mongolian troops - a preferable fate than to die in the trenches of Inner Mongolia. 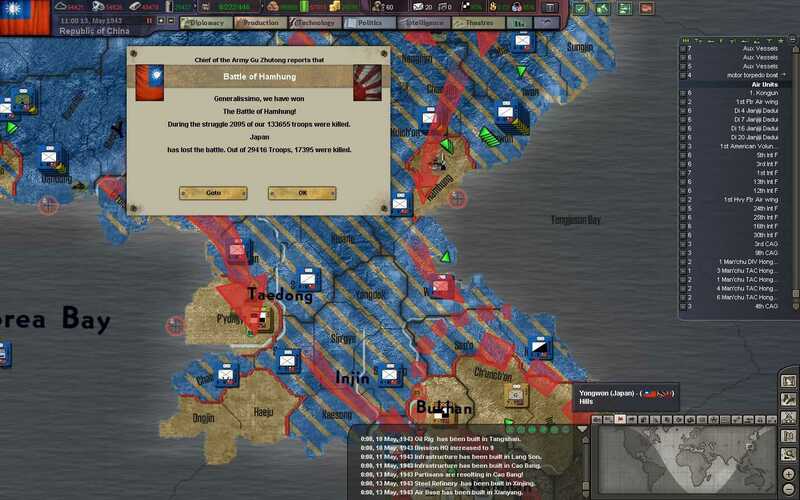 The war in Indochina once again proves itself to be a bloodbath. 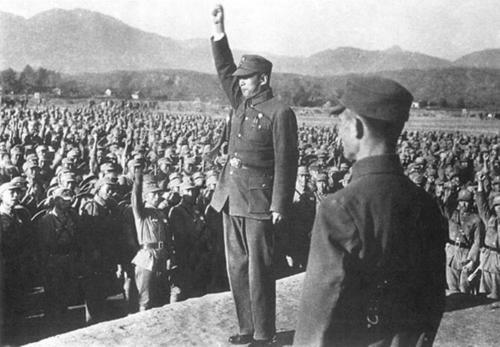 Local NRA commanders appeal for more troops but their needs are shelved for the more crucial offensive in Manchuria. 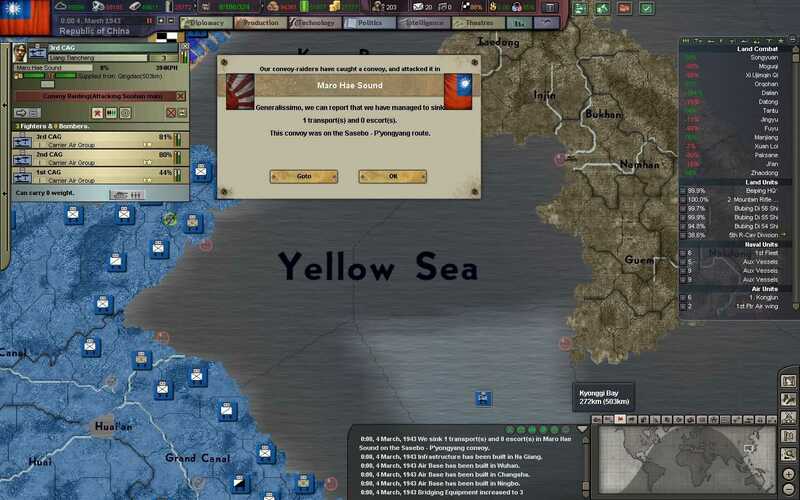 In a shocking development, the sieging force at Dalian receives word that Japanese marines have begun landing in their staging areas to the north of the city. 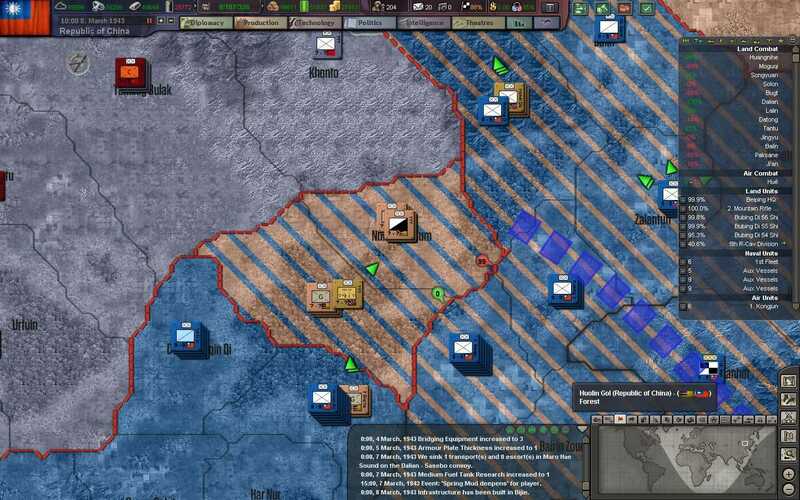 Our commanders scramble to send troops to the beach, while our reserves from the Mongolian border quickly board trains for Manchuria. Those reserves will take at least 3-4 days to reach Dalian. 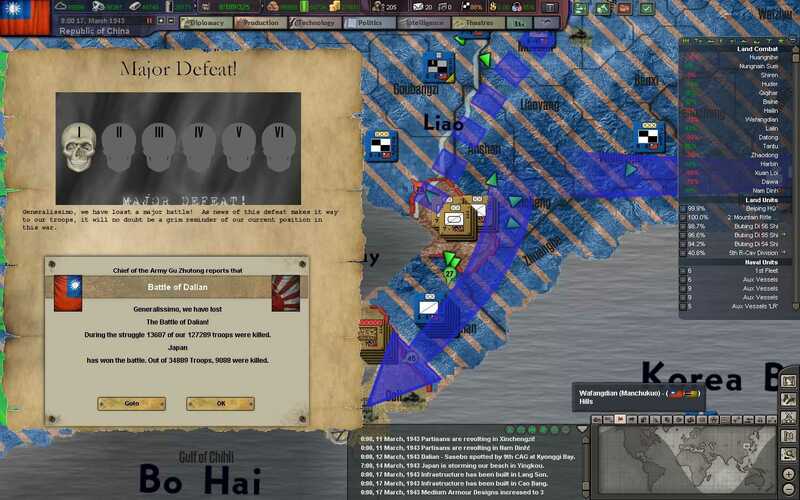 The Japanese marines seize the beach without trouble, and start to land regular infantry and armored units. 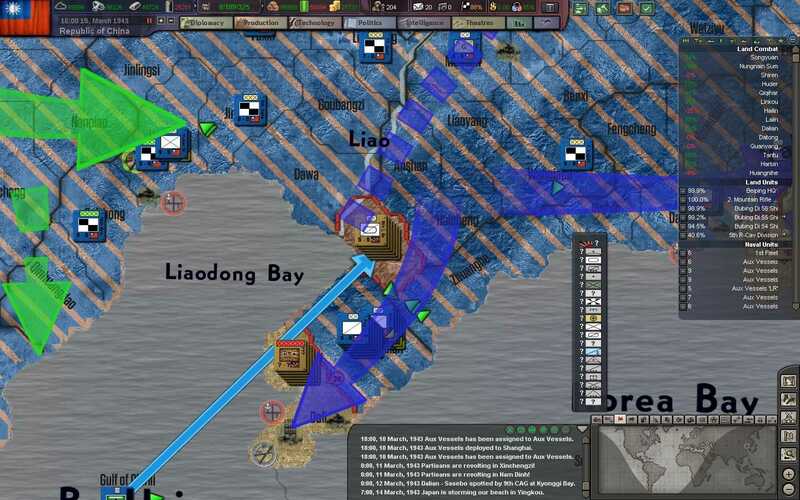 Reserves from the Siege of Dalian are moved to the eastern shore of the Liaodong Peninsula, in order to secure an escape route and to prevent an encirclement. 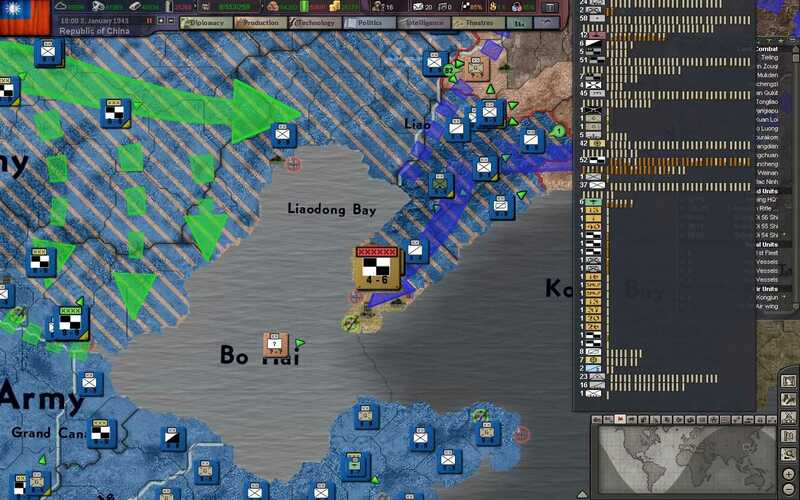 The Siege of Dalian is lifted in order to deal with this latest invasion attempt. As our divisions leave the city limits, the Japanese defenders sally out to apply more pressure on the staging areas north of Dalian. 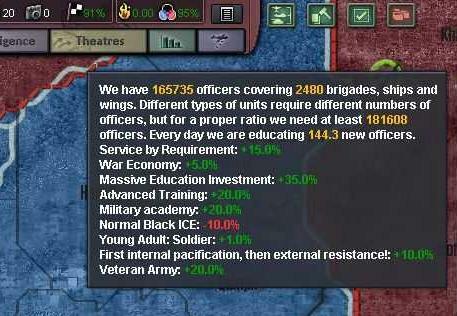 While our reserves rush to contain the invasion, our command and headquarters units are tasked to hold out as long as possible. Our efforts to equip our headquarters units with defensive equipment is finally paying off. The Kuomintang begins in secret research into atomic materials, which has started under a clandestine unit, tentatively named "Unit 428". The scientists and researchers of this unit are housed in a facility in Lanzhou, and are forbidden to leave the site. Meanwhile, the last remnant of the Manchukuo puppet state, the city of Harbin, is taken by our vanguard motorized units. Emperor Pu Yi, who had been installed in Manchuria as the rightful heir of the long deposed Qing Dynasty, has long before fled to Japan. 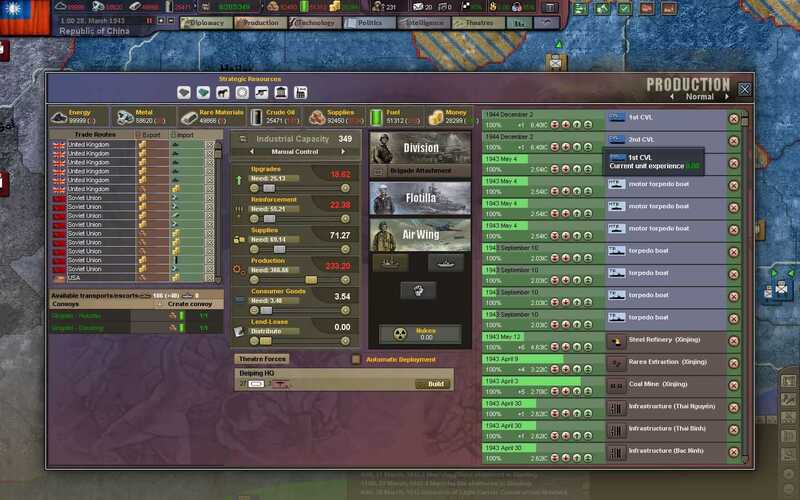 Only the desperate dare stand and fight off the inevitable advance of our forces. 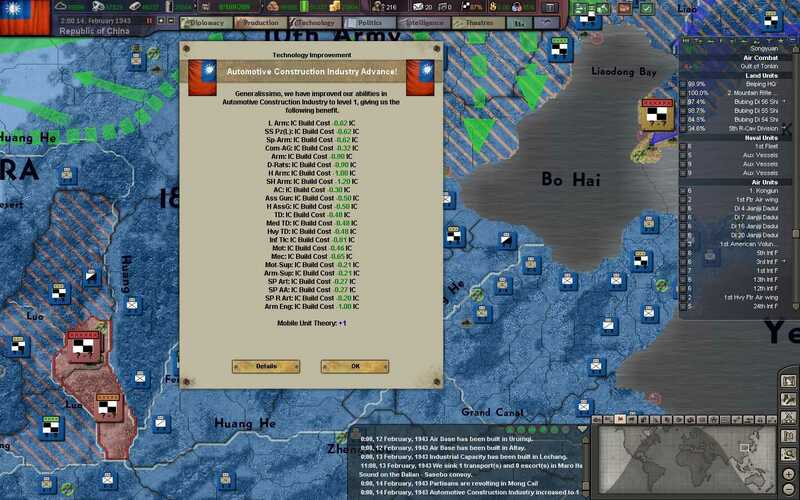 NRA forces north of Dalian repel the first attempts to clear the Liaodong Peninsula, but our headquarters unit on the eastern shore is nearing its breaking point. The headquarters unit is only equipped with a few batteries of anti-aircraft and outdated anti-tank guns, and struggles to defend points against Japanese armor. Luckily they will be relieved by our regulars soon. 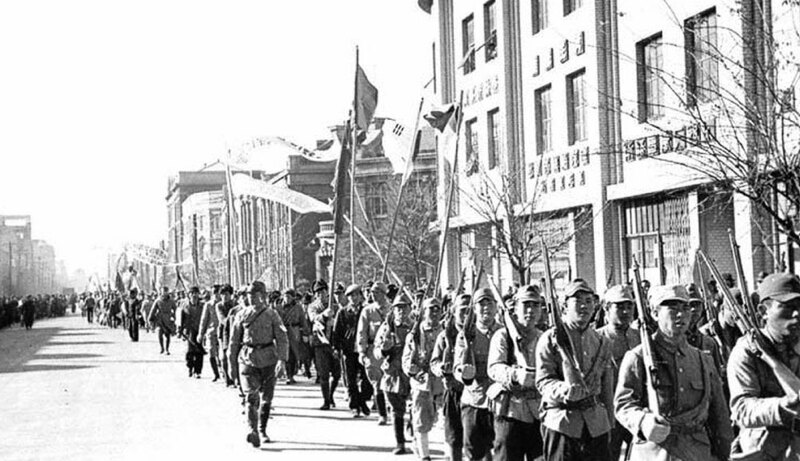 With the fall of Harbin, the Manchukuo government surrenders, and all former puppet troops lay down their arms and travel to internment camps around Beijing and Taiyuan for reorganization and rearmament. Japanese divisions still present in Northern Manchuria are now surrounded and completely cut off from supply, but they do not yet surrender. Our journey is nearly complete - and soon the Japanese will crawl back to the caves they came from! 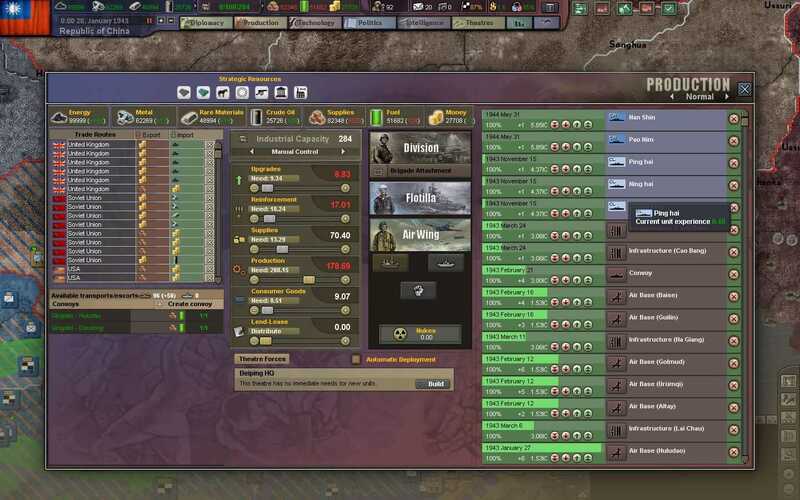 Morale among our troops is at an all-time high, despite the long marches as the NRA sweeps across Manchuria. Time is taken to honor the dead, who have made this victory possible. Even the bodies of the puppet regime of Manchukuo and Mengukuo are given full rites - as many were conscripted forcefully and given no other choice. The Manchurian officer corps is quickly absorbed into our own, which brings a nice boost to our pool of NCOs and commissioned officers. The NRA is still lacking in qualified applicants and training facilities, however, and must finish this fight without them. The ROCN issues its first orders for light carriers. When finished, these models will be outdated compared to Japanese and American carriers, but they will surely help to strengthen our currently weak navy. 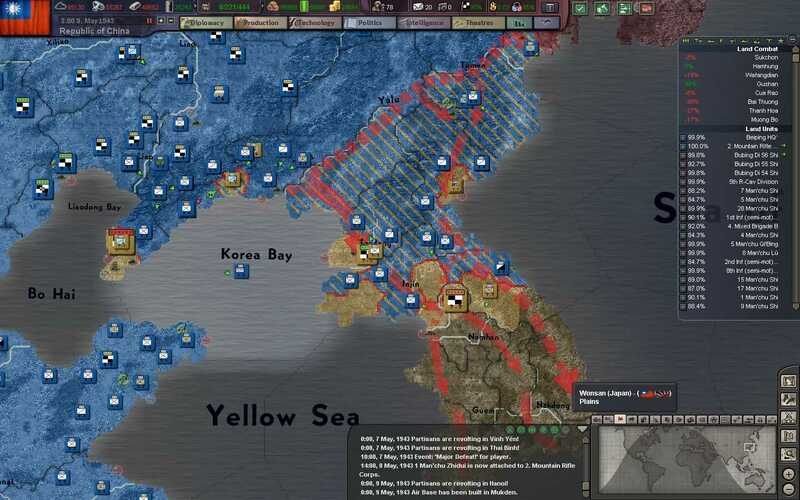 Now that most of our troops are free from major combat operations, most of Army Group North positions on the Korean border for Operation Blackfish - the final leg of our journey to evict the Japanese from the mainland. 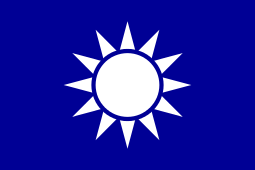 The Kwantung Army has for all intensive purposes ceased to exist, and the only remnants of the IJA are holed up in Dalian. Only irregulars and garrison detachments stand in our way in Korea. 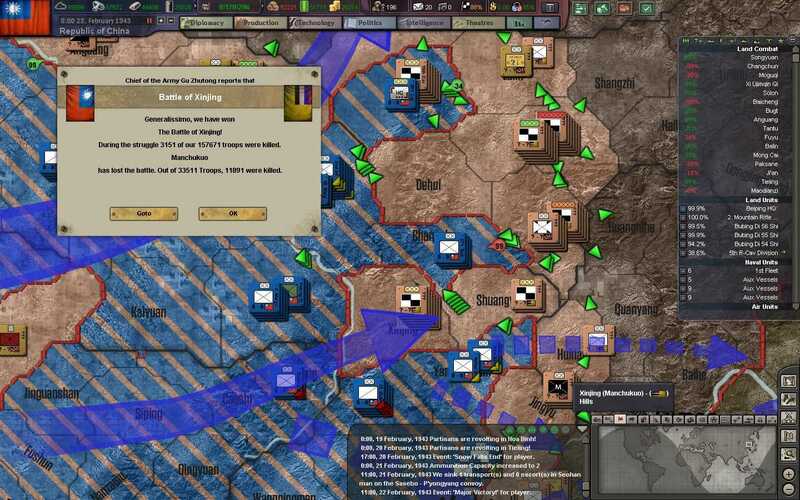 Our troops are to prioritize urban centers, by first capturing the northern cities of Pungsan, Pyongyang, and Chongjin. 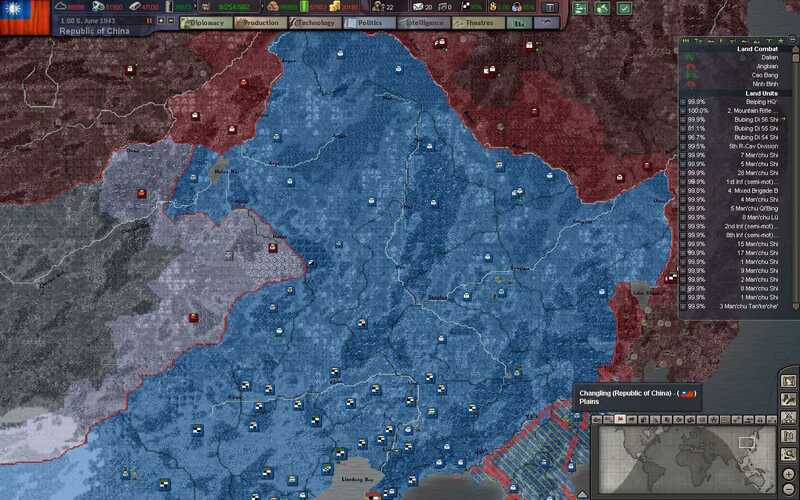 From there they are to seize the central cities of Seoul and Suwon, and then to quickly advance to the southern port of Pusan, before the IJA can land a proper army to oppose us. 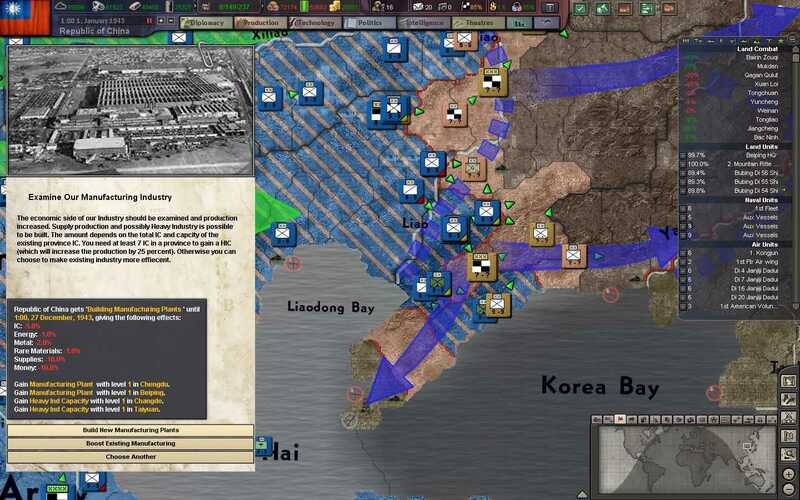 Chongjin, which possessed considerable defensive structures, and industry, is taken without a fight, as Japanese forces retreat further into Korea. 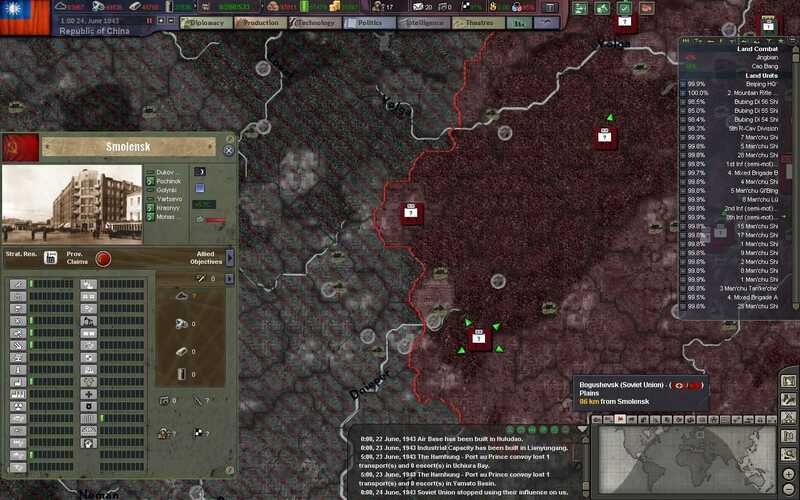 The general staff guesses that the last remnants of the IJA will attempt to make their final stand in central Korea, where they can concentrate their numerically inferior forces along a thinner line. 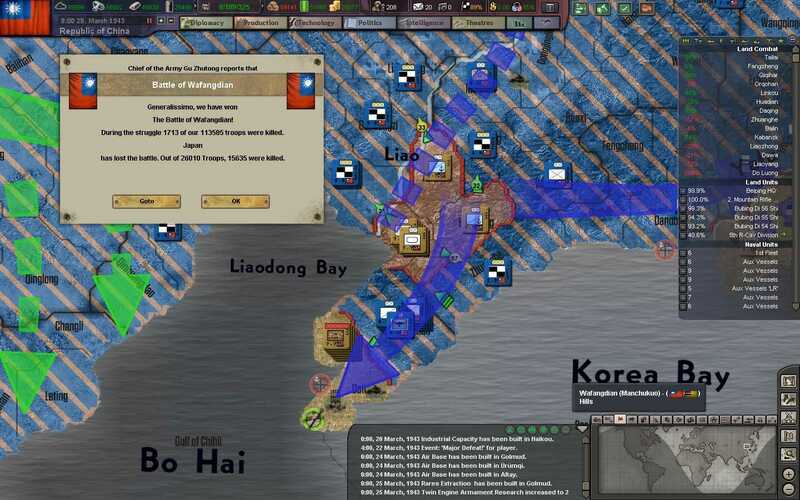 In another surprise move, the Japanese do not reinforce Korea but make another attempt to relieve the Siege of Dalian, by landing more forces to the east of the Liaodong Peninsula and behind our advance in Korea. This invasion is only carried out by the Japanese SNLF (Special Naval Landing Force), and they rush towards securing the port of Dandong. 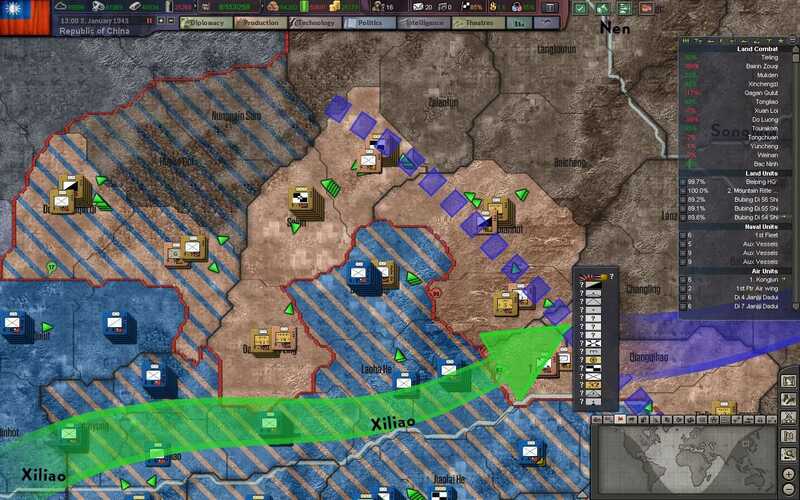 With the liberation of Manchukuo, more of our specialists are diverted to further increase the mobilization of our economy for war. Although the imminent threat of destruction has faded, Japan will still prove to be a dangerous threat, and our air force and navy will require much more industry if we are to eventually take back the Pacific from the Japanese. 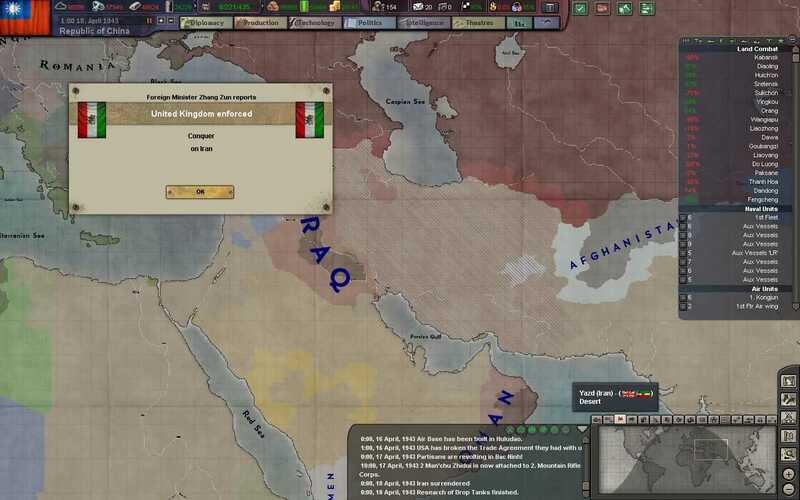 The UK completes its conquest of Iran, and begins diverting oil to the Soviets and to their forces fighting in Egypt and Libya. The Shah is deposed, and his son Reza Pahlavi is raised to the throne as a loyal puppet of the British Empire. The entire Middle-East, except for the now collapsing state of Saudi Arabia, is now firmly under the control of the British. With the fall of the Northern ports of Murmansk and Archangel, lend-lease supplies from the UK and US now flow to the Soviet Union through the "Persian Corridor". 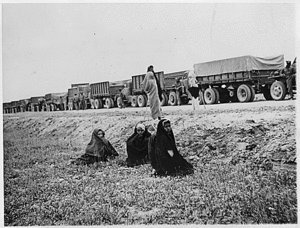 Although the Persian Gulf ports and the Iranian railroads cannot meet the massive needs of the Red Army, this supply route is the next closest avenue for aid, than from the far eastern port of Vladivostok. 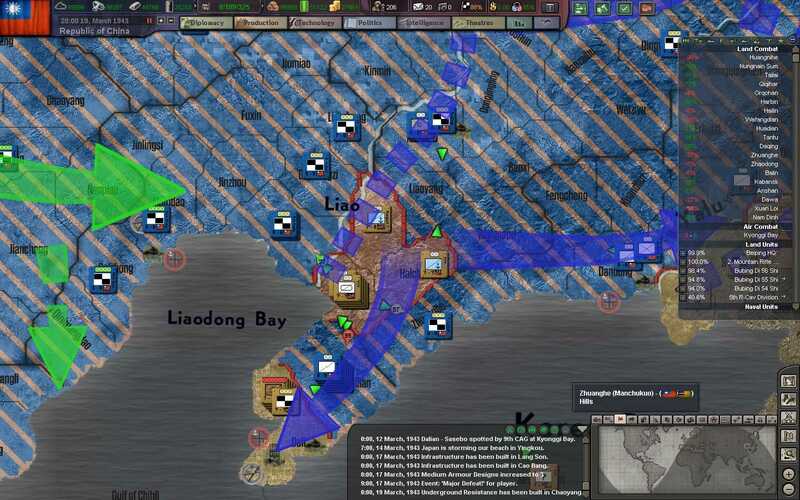 After a long battle, the invasion to the north of Dalian is forced back from the shores at Yingkou, and the Japanese invasion force is now trapped and encircled south of Mukden. 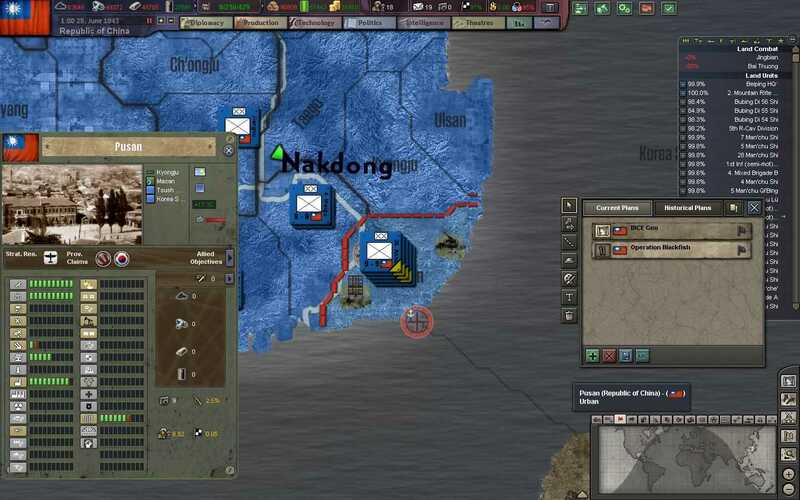 The landing near Dandong has failed to secure the port as well, and the SNLF begins receiving counterattacks from our reserves in the rear. 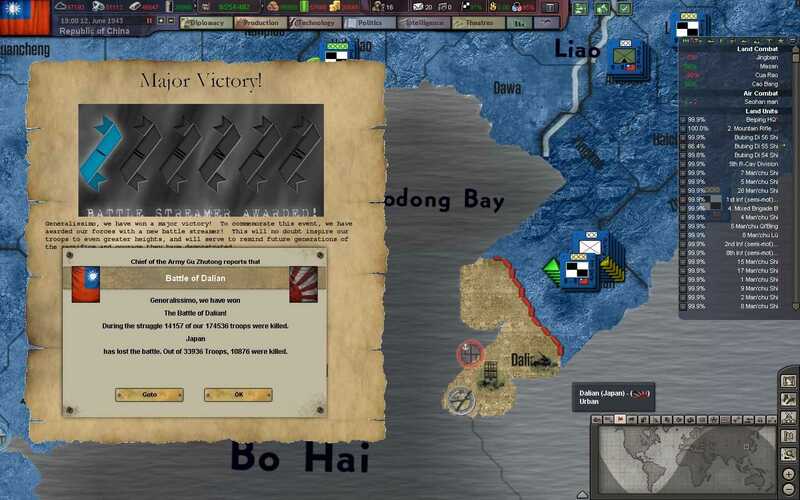 The remnants of the invasion north of Dalian is crushed, and the Siege of Dalian is quickly renewed, in order to not give the defenders any chance to rest. 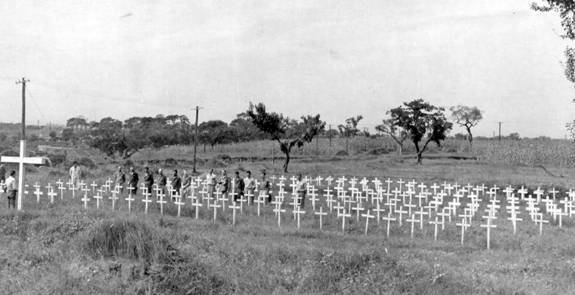 The NRA in Indochina still faces over 500,000 well-equipped men of the IJA, and fight from retreat to retreat. Still, the Japanese bleed for every kilometer they move north. 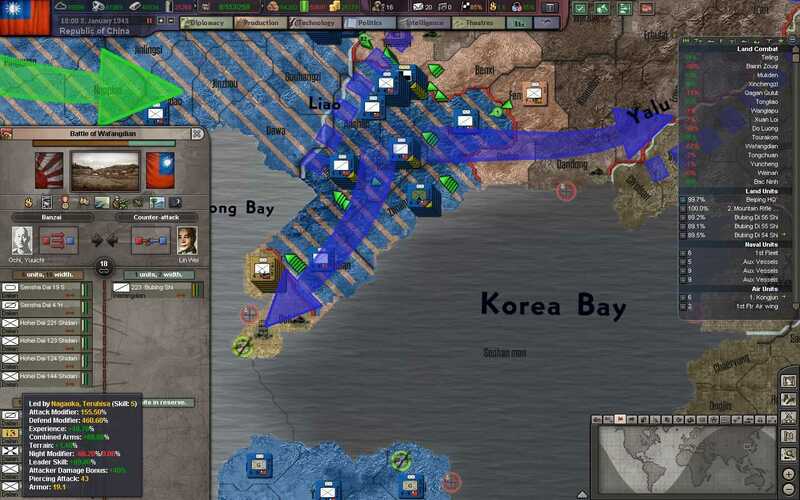 Operation Blackfish is advancing nicely, as our troops surround Pyongyang and the port of Hamhung. Our motorized units have also reached the outskirts of Seoul and Suwon, which is only lightly defended by headquarters and garrison units. 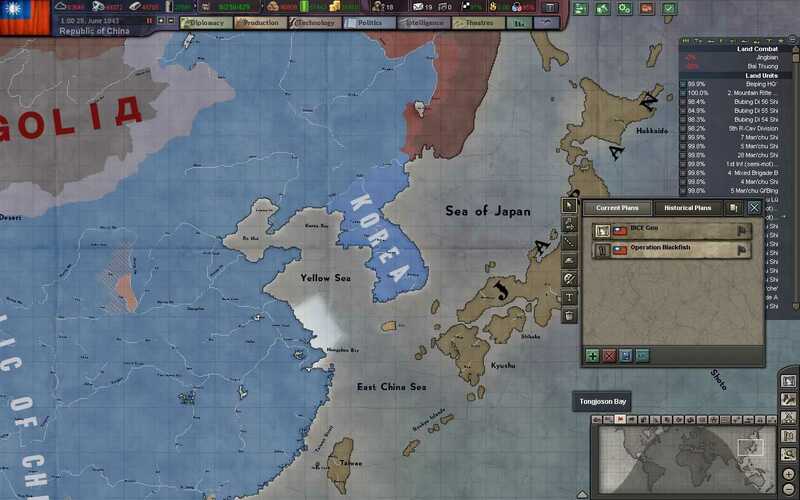 Surprisingly, the Japanese do not have the manpower to span the length of the Korean Peninsula. Such is the scale of destruction of the Kwantung Army. 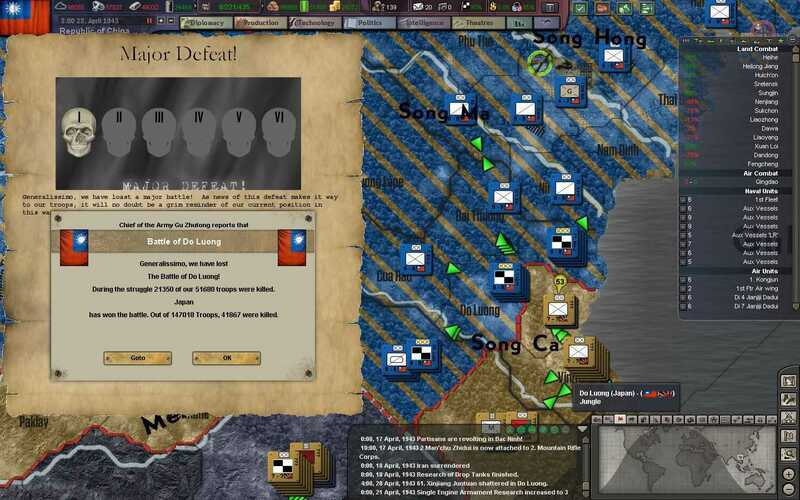 Days later, SNLF forces lay down their arms to the west of Dandong. 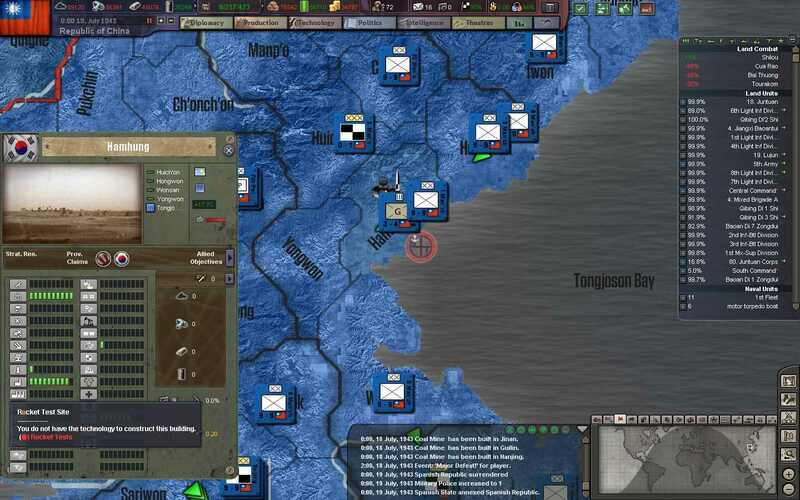 The shoreline around Dalian is garrisoned to ensure that future landings by the Japanese will not be as successful. 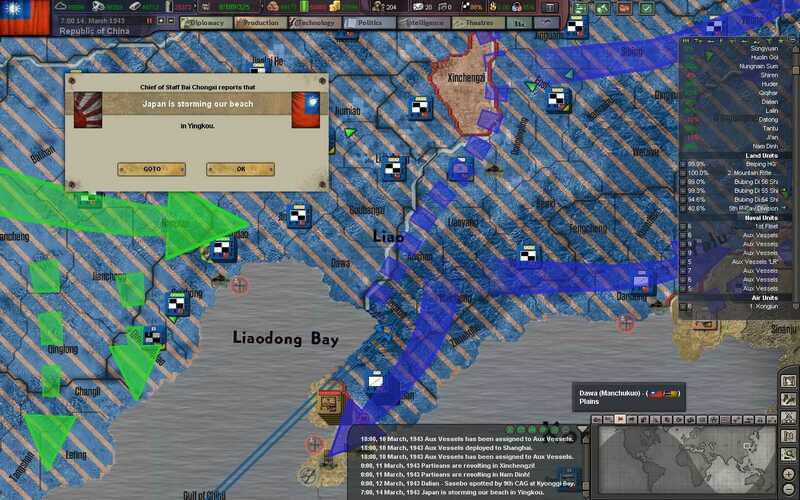 A sizable garrison surrenders at Hamhung, and strangely enough the Japanese Navy is not there to evacuate them to Japan. 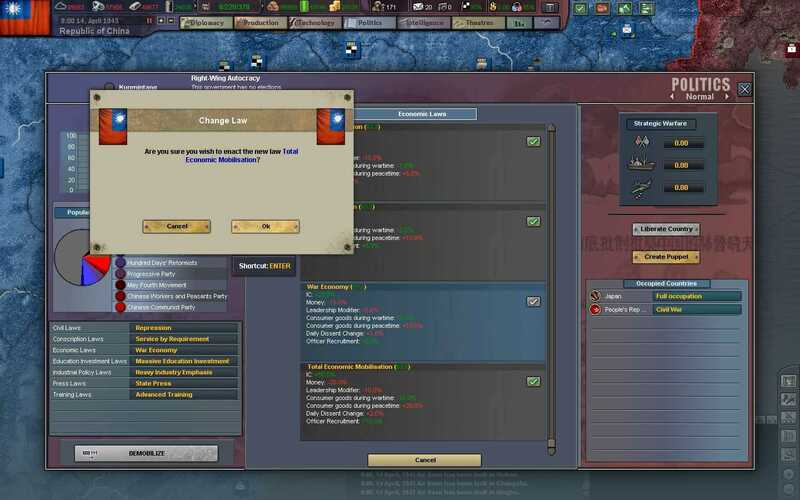 It seems that the emperor has demanded that all troops left on the mainland are to give their lives for the Empire. These green garrison troops, who have not witnessed the horrors of the war on the Northern Front, gladly die for their country. 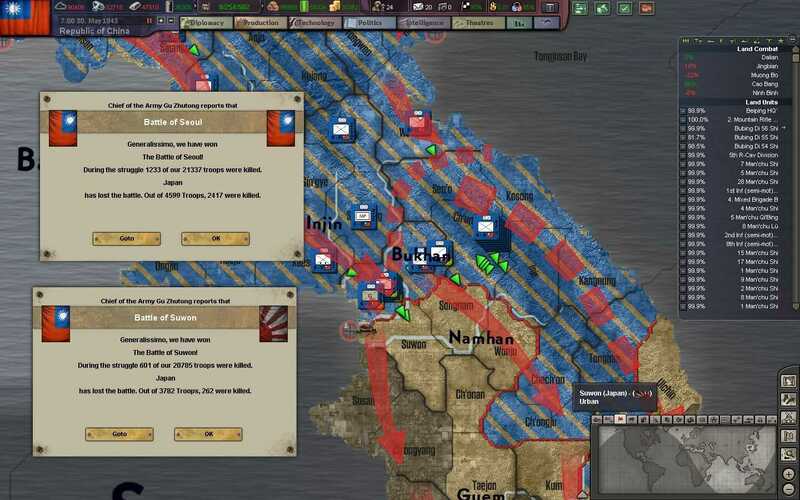 In the North, our troops clear out the last of the Japanese resistance. 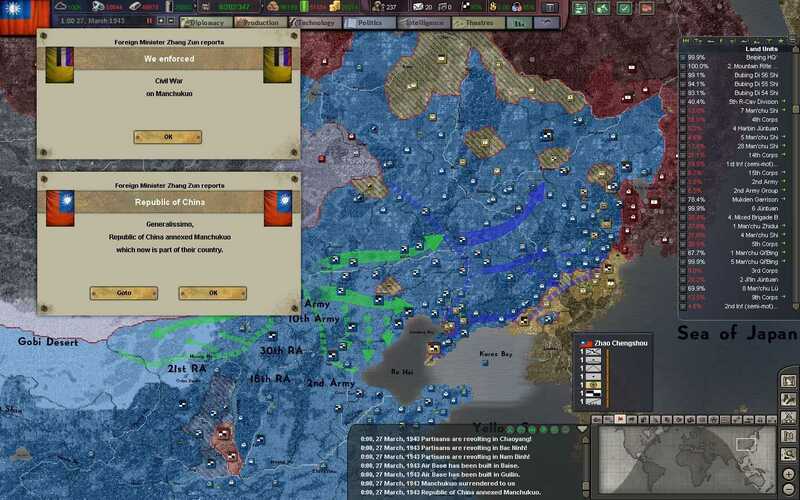 Manchuria is finally free of the Japanese yoke. 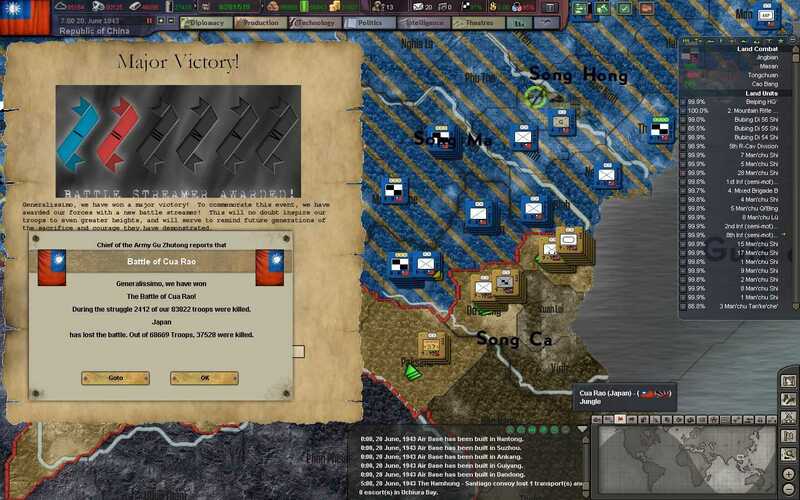 Seoul and Suwon are secured after quick fights, and our troops race down the peninsula towards the southern port of Pusan. The path is clear and we see no Japanese troops in our way. The first of our domestically produced destroyer fleets is attached to the 1st Fleet docked in Hainan, and more destroyers are immediately put on the production line. 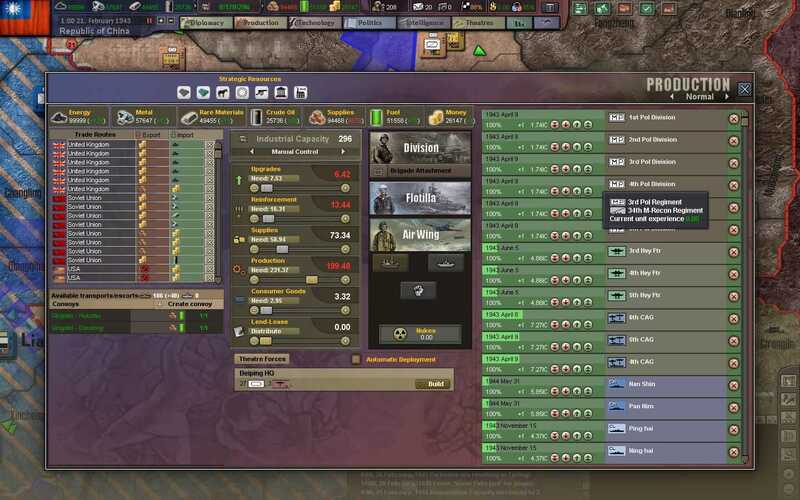 After several months, the Siege of Dalian ends with all defenders KIA or MIA. The siege command reports only several IJA troops and officers surrendering, with the rest being killed or battle or committing suicide once our troops secured the city center and the city's port. China now firmly controls the Bohai Sea. 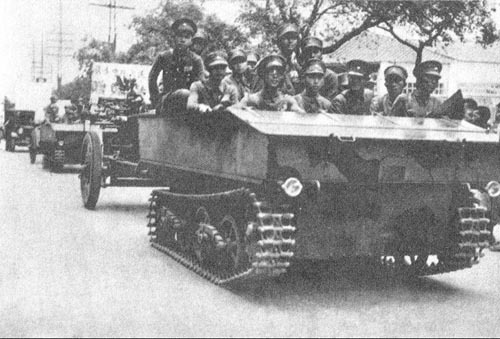 Our researchers and military technicians begin focusing their efforts on modernizing our armored capabilities, and are greatly helped by the factories and institutions recently entering our control in Manchuria. We are now able to fund and support double the amount of research as we were previously. 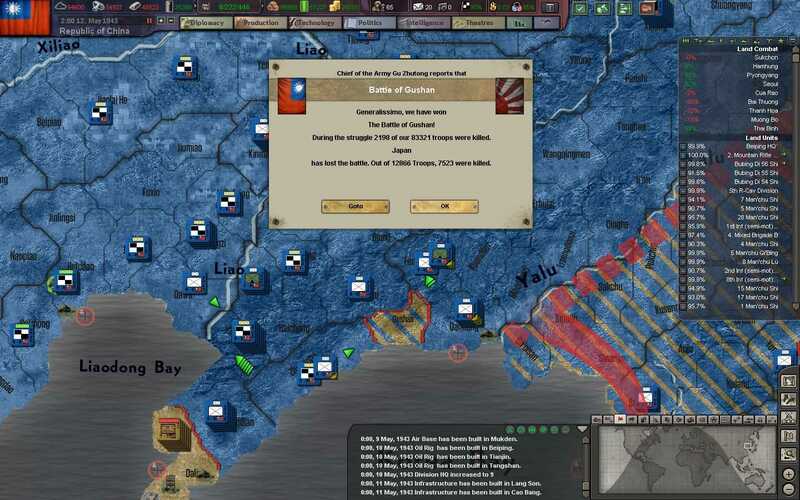 We are finally able to hold the Japanese back in Indochina, after a botched attack, and subsequent mass Banzai charge, in the jungles of Cua Rao. The war in Indochina is messy, disease-ridden, and often confusing for both our commanders and our forces on the ground. 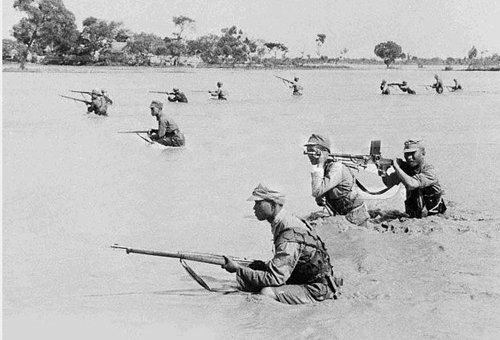 Pictured above is a platoon of men moving through low waters in the vicinity of the Song Ca River. 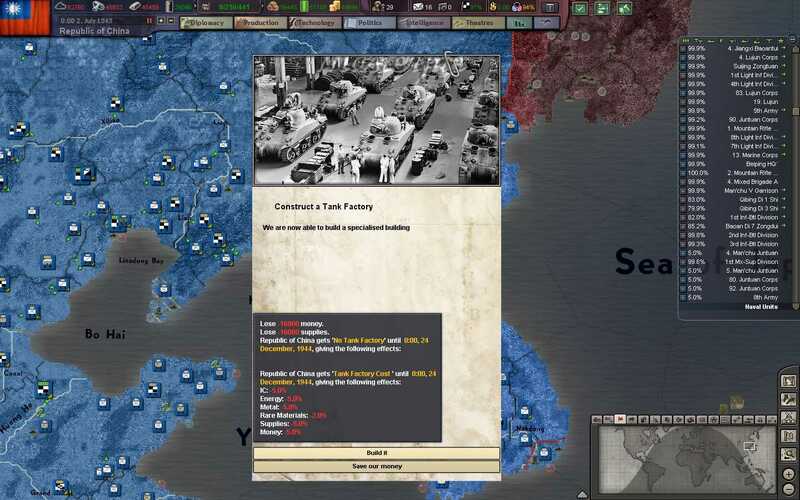 In Korea, Operation Blackfish is wrapping up with the capture of the port of Pusan, and the surrender of the last garrison units on the peninsula. 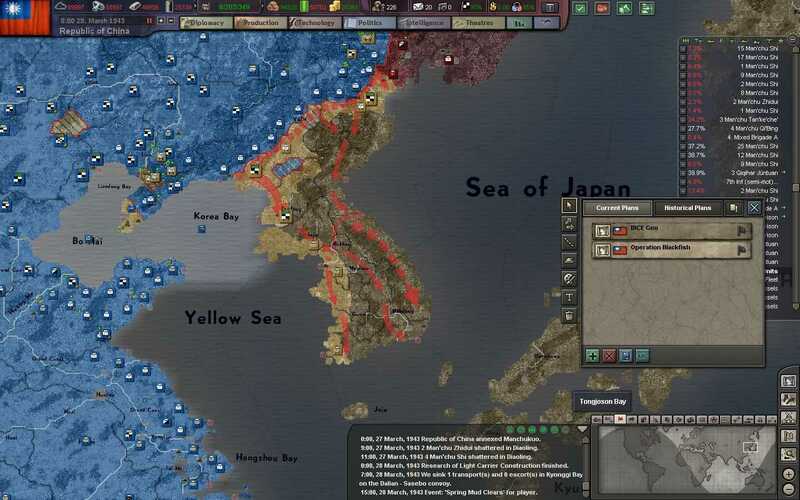 Generalissimo Chiang proclaims the independence of Korea, which for almost 40 years had been under crushing Japanese rule and occupation. One of the terms of independence is the indeterminate lease of the port of Pusan to the Republic of China, for "security" purposes. The city also houses a massive Japanese air base, which will be used to full effect in the battles to come. 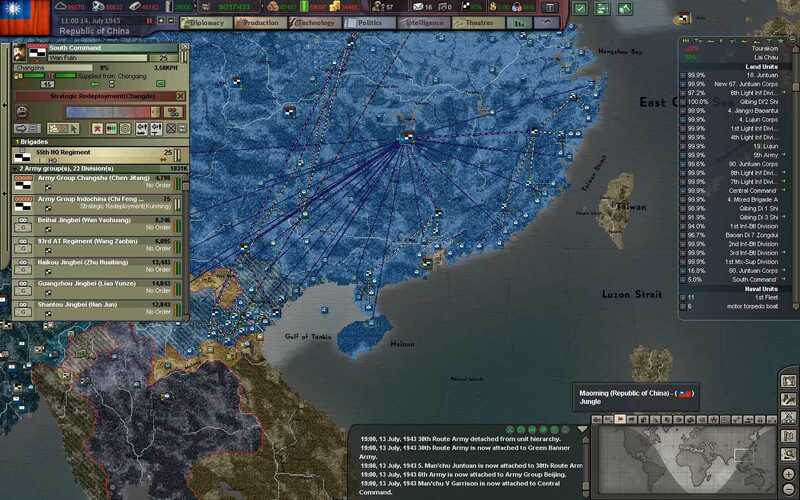 Although Korea is nominally independent, they are very much still under the control of China, and all foreign relations are to be dictated by our diplomatic corps in Nanjing. 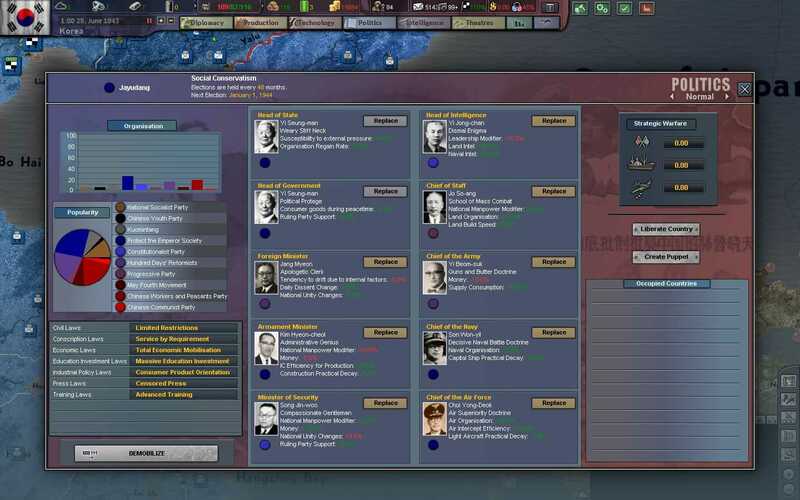 The new government of Korea will be lead by Syngman Rhee, a longtime Korean independence activist and fervent anti-communist - a trait very appreciated by Generalissimo Chiang. A day after independence, Korea declares war on their former oppressors, Japan, and begins military collaboration with the NRA. On the Eastern Front, massive battles rage in and around the city of Smolensk, where the bulk of the German Army retreated after Operation Typhoon failed to capture Moscow. The retreating Army Group South stages massive tank battles on the outskirts of Kharkov, where numerous regiments of T-34s are lured in and systemically destroyed. 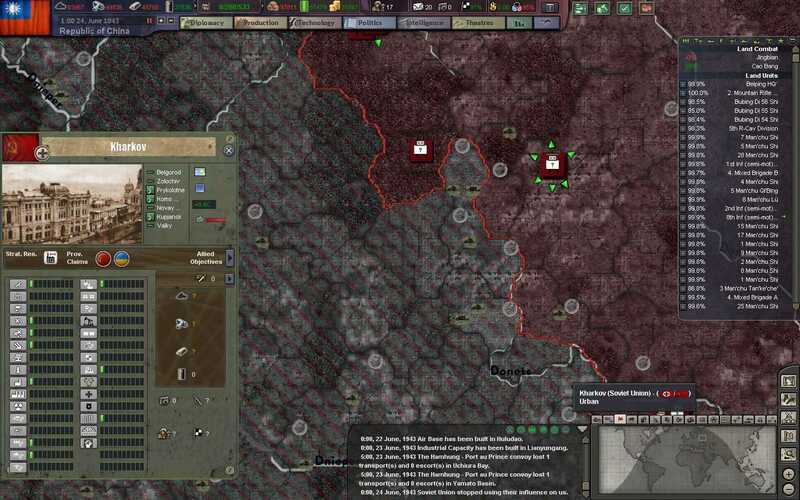 The continuous battles, however, are taking their toll on the Wehrmacht as a whole. Replacement tank crews are barely trained, and Panzers are frequently lost and subsequently abandoned due to mechanical failure. The last warm-water port of the USSR in Europe, Archangel, is taken by the Finns after being sieged for many months in the Spring. 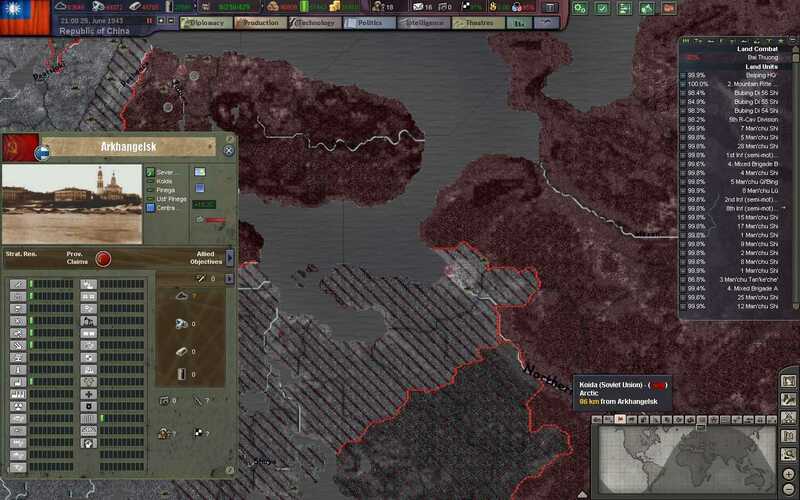 The port had already been rendered inoperable due to German air and submarine activity in the White Sea, but the loss of this port is another blow to the Allied Lend-Lease system that the USSR can not afford. 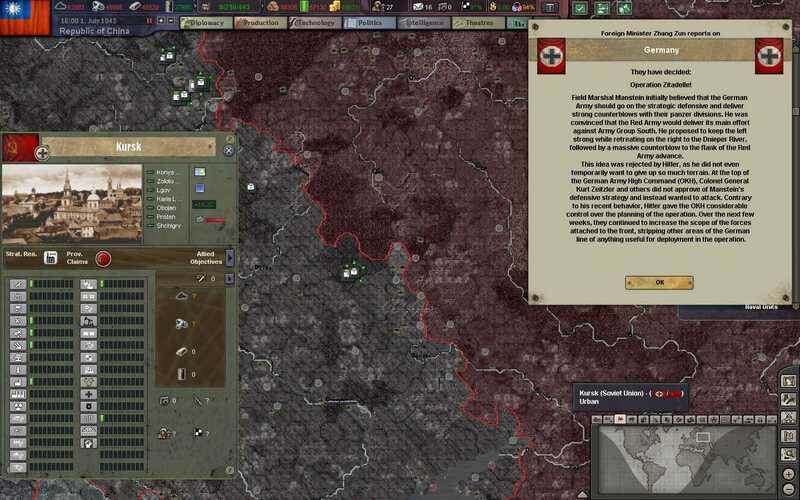 Although the Wehrmacht strongly pushes for a tactical retreat and strong counterattacks, Hitler forces his commanders to begin Operation Citadel - a massive armored operation whose goal is to destroy the Soviet army groups operating near the city of Kursk on the eastern edge of Ukraine. The growing auto industry in Shanghai is now approved for expansion, and tank production lines in the factories are expected to be online within 10 months. With the war in the mainland over, the NRA begins restructuring its forces. 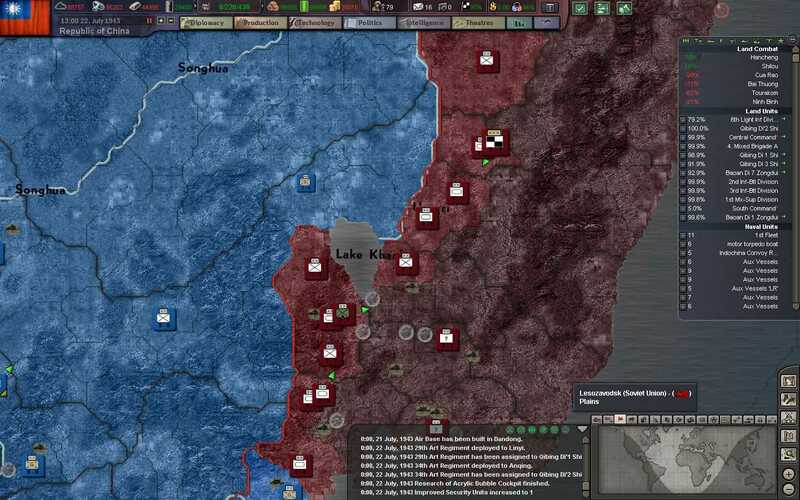 The NRA is now divided into two theatres - Central Command, which includes Northern China, Manchuria, and the communist blockade, and South Command, which mainly consists of Army Group Indochina and Coastal Guard commands. 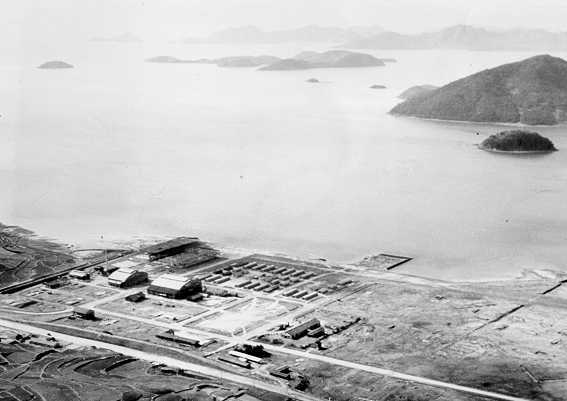 A seemingly derelict factory on the outskirts of Hamhung turns out to be a fully functional rocket test site, built by the Japanese during their occupation of Korea. 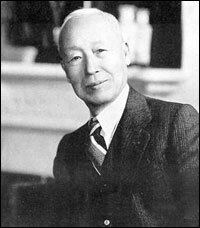 Syngman Rhee is "convinced" to lease the area to China, after Chiang makes some concessions to the Korean government. 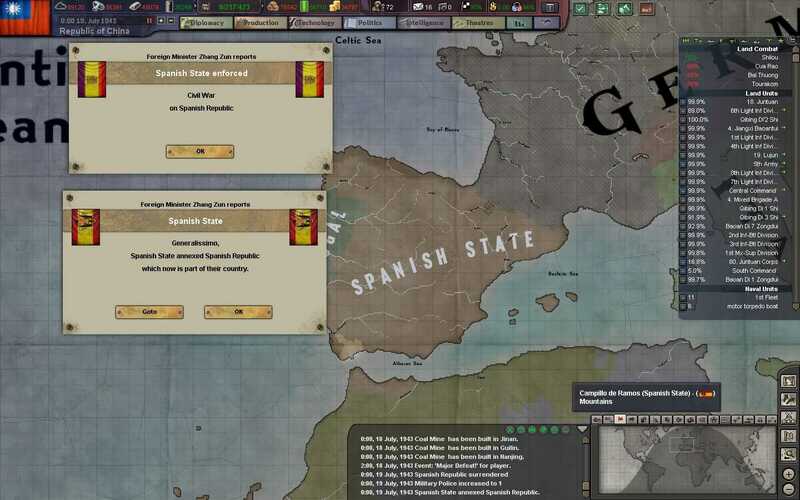 Meanwhile, in Spain, the Spanish Civil War finally ends after nearly 7 years of fighting, with dictator Francisco Franco and the fascist party securing their hold over the state. 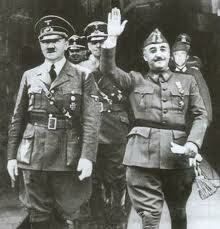 Franco now begins holding talks with Hitler and other Axis powers. Thanks for reading! 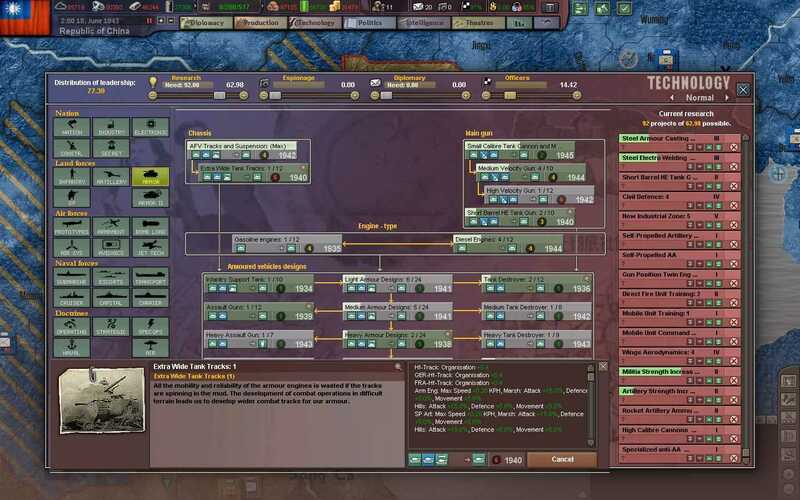 As always feedback on history, gameplay, military tech, etc. is welcome in the discussion thread. Check back on Mondays for new episodes.